Sushi belts are lucrative for the owners and affordable for diners – especially college students. This is one of the most memorable lines from the 1984 comedy Repo Man, spoken from one L.A. punk to another as they debate the next stop on their crime spree. It’s a sentiment any broke college student with expensive taste can sympathize with. Sushi is delicious, but why spend five bucks on a couple measly slices of snapper when you can pig out at dozens of other places for the same price? Luckily, quality sushi doesn’t have to be expensive. Sushi belt restaurants, known as kaiten-sushi (rotation sushi) in Japan, offer plates of sushi on metal conveyor belts for remarkably low prices — and there are plenty in Eugene. 541 Sushi downtown offers all plates for $2, every day. Sushi Station in the Market District serves individual plates between $1.50 and $3.50. Sushi Island’s two locations offer those same prices, but all selections from the belt are priced at $1.50 at its extremely crowded happy hours. The conveyor belts run right by customers’ tables and generally wrap around a kitchen, where a small team of chefs continually prepares new plates for the conveyor and throws out old ones. 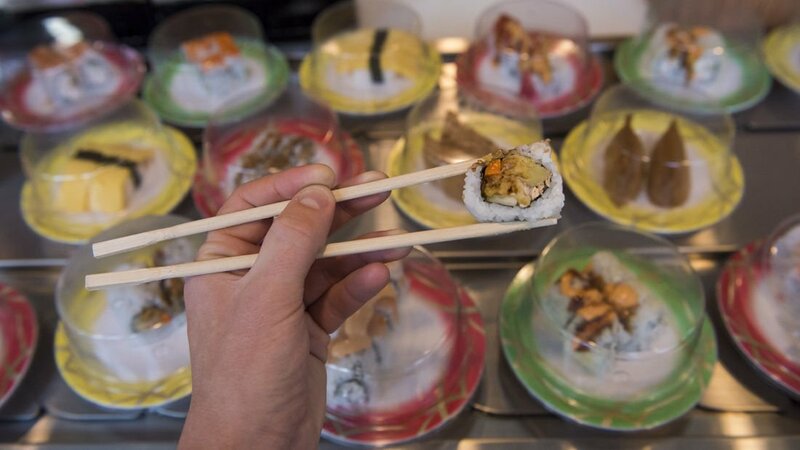 Sushi and other small dishes are served on plates that are colored differently depending on price. Customers may also make special orders. One doesn’t necessarily go to a conveyor belt restaurant to find that perfect cut of tuna. Rather, customers — especially college students — are drawn to the low prices and accessibility of conveyor belt sushi. Sushi Island has two locations: one in West Eugene and one closer to campus in The Patterson apartment complex on East 13th Avenue. The Patterson houses a large number of international students, who provide much of Sushi Island’s clientele. Kaiten-sushi was created in 1958 in Japan by Yoshiaki Shiraishi, who found the salvation for his understaffed sushi restaurant after seeing beer bottles roll off a conveyor belt at a brewery. After Shiraishi’s invention was displayed at the 1970 World Exposition in Osaka, a boom followed, and restaurateurs both in Japan and abroad began adopting the concept. Today, there are large companies that deal in sushi belt paraphernalia. Vermont company Modu has the U.S. monopoly, making belts as well as plates; in Japan, Ishino Seisakusho is the biggest brand. In Japan, kaiten-sushi has proven lucrative in an economy where stagnating wages have driven more expensive eateries out of fashion. As 541 does in Eugene, several chains in Japan offer all plates for the same price – often 100 yen (81 cents), inspired by a trend of 100-yen shops. Sushi ingredients can be expensive, especially at the quality required to serve them raw. So how can these restaurants make a profit selling sushi so cheaply? Thus, at 541, you may see a bowl of edamame (soybeans) that costs less than $2 to prepare next to a couple shining slices of salmon that cost more. Sushi Island also does not strictly adhere to the $1.50-for-everything happy hour rule. Though this rule applies to everything on the belt, about a third of the items on its menu are only available by order and cost the same at all times. Happy hour at Sushi Island is cheap, but it’s advantageous for another reason: the turnover between plates is much faster, leading to a fresher product. The prospect of raw fish sitting out in the open for uncertain amounts of time might turn some diners off sushi belts. But Nick Alviani, a health inspector for the Lane County Department Of Environmental Health, says there’s nothing to worry about as long as the restaurants follow the proper health codes. According to the most recent FDA food code, passed in 2013, restaurants may only keep food in a non-temperature-controlled environment for four hours. “After every four hours there’s a high potential risk of having bacteria grow to a certain level that might get people sick,” Alviani said. Belt restaurants must approve a time-keeping procedure with the Department of Environmental Health. Some restaurants make timetables; others use stickers at the bottom of their plates to mark when the dish was made. 541 rotates the colors of its plates by the time period in which the dish was made — divided into three-hour intervals — rather than by price. A good indicator of how long dishes on a conveyor belt have been out is the color of the avocado used in rolls. Avocados brown within a few hours, so if there are brown spots on the avocado, it’s likely the plates haven’t been changed in a while. The system seems to work. 541, Sushi Station and Sushi Island currently boast health scores of over 95. If you still don’t want to risk a few brown spots on your avocado, Eugene has no shortage of sit-down restaurants. But at a place like Sushi Island, $3 could get you a sufficient meal of two filling rolls at happy hour. If there’d been a sushi belt in L.A. in 1984 – at least one that those punks from Repo Man knew about – they might have just scrounged together a few quarters, or maybe moved their dine-and-dash operation to a steakhouse. Anna Lieberman contributed to this story.